“Gesundheit! 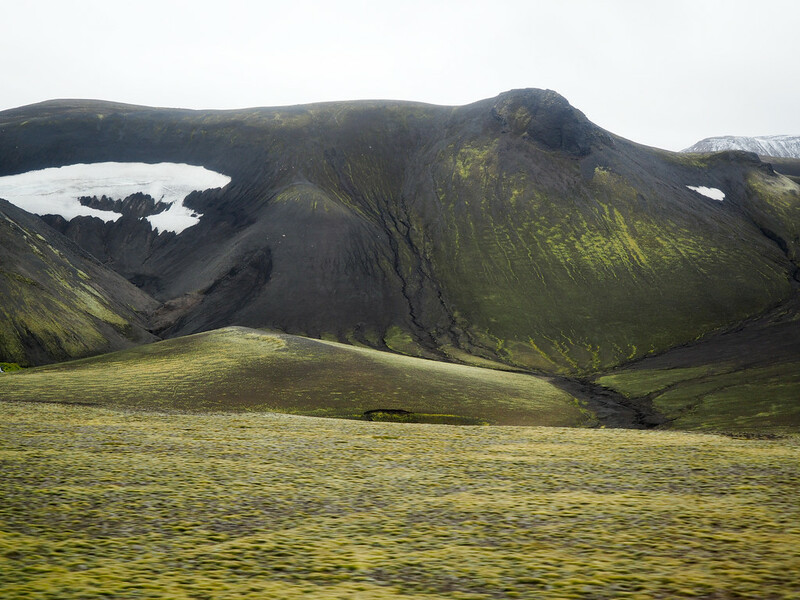 !” my dad said, when I told him where we’d be going on one of our day tours while in Iceland. I rolled my eyes; after a few days on the road, the Dad Jokes were already getting to me. 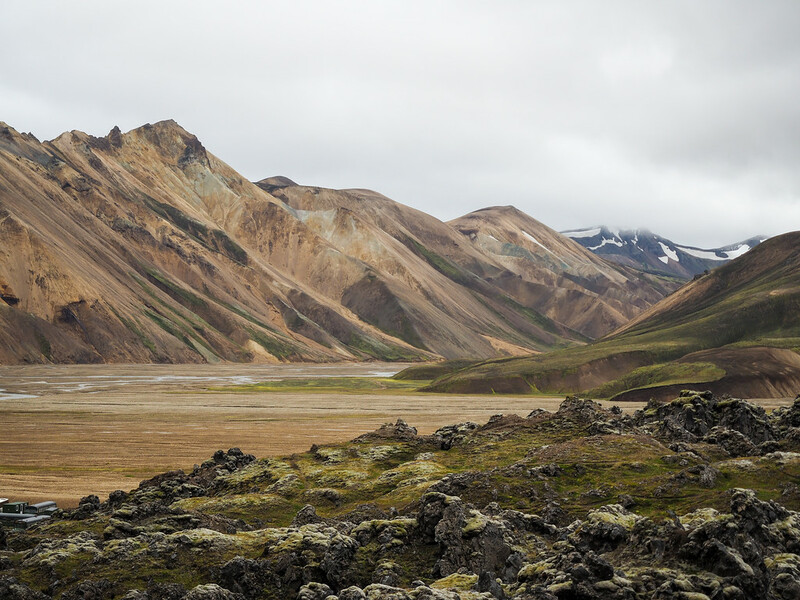 The place in question was Landmannalaugar, a colorful spot in Iceland’s center known simply as “the Highlands.” You’ve probably seen the region’s rainbow-hued mountains in photos, and might even be aware that the area is very popular with hikers. 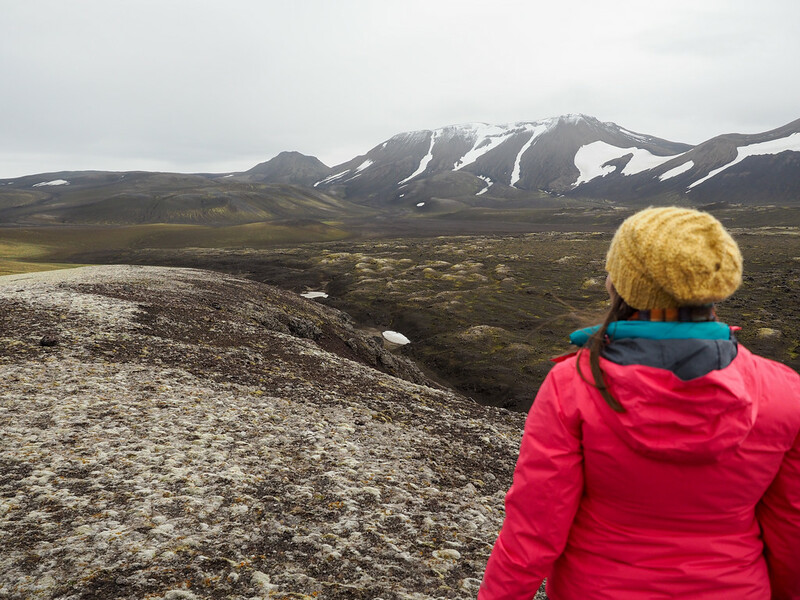 I desperately wanted to see those colorful mountains and get a taste of Iceland’s Highlands – an area I’ve never successfully visited on my previous winter trips to Iceland. 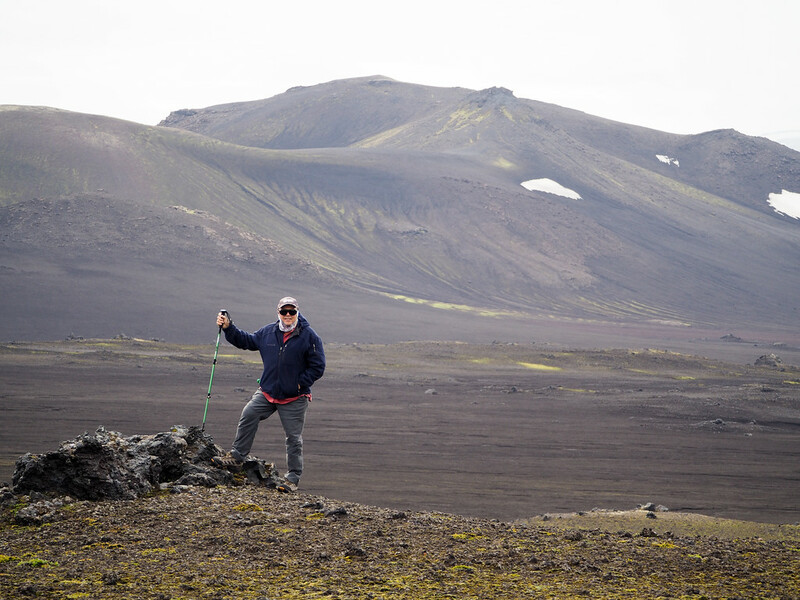 But my dad and I had limited time in Iceland, and he’s waiting on a knee replacement – meaning we weren’t going to be doing any serious hiking. 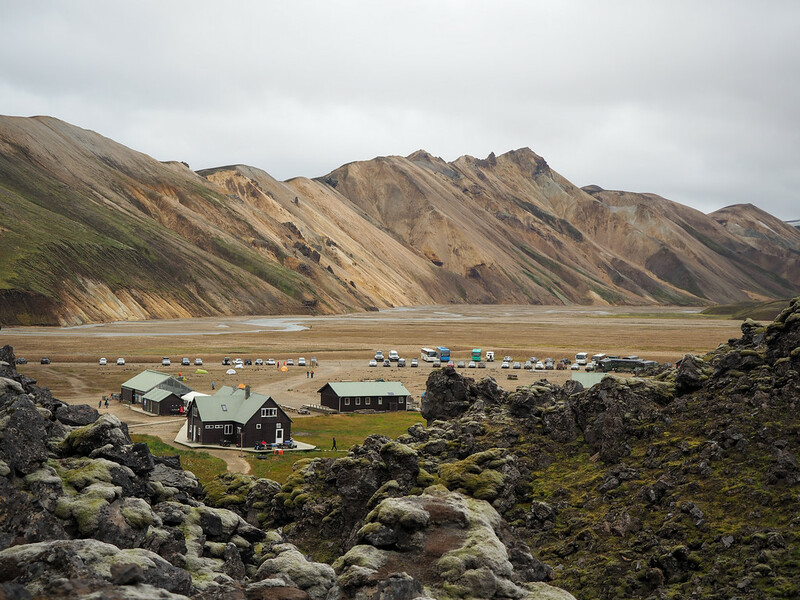 So the question then became: could we visit Landmannalaugar in just one day? 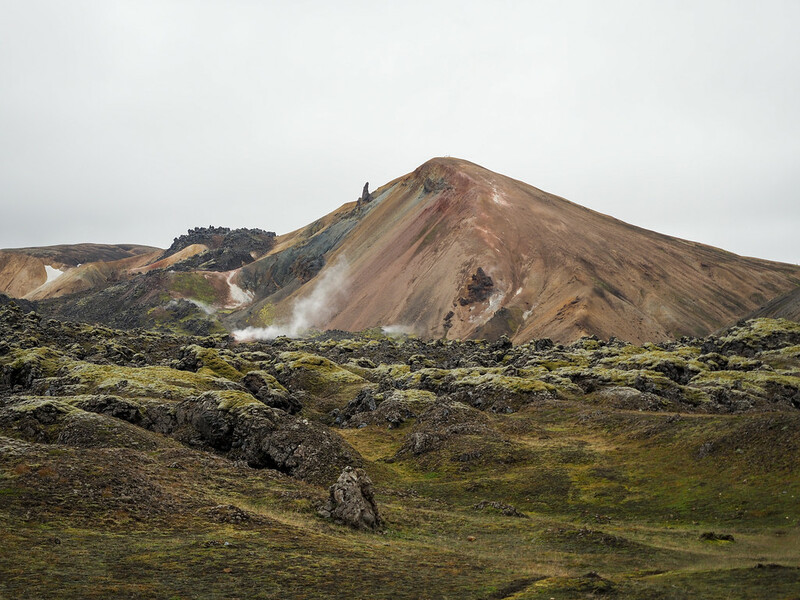 A quick Google search revealed that there WERE, in fact, day trips to Landmannalaugar from Reykjavik. But they were long tours, and only allowed for limited time in those jaw-dropping rainbow mountains. In the end, I decided to book a tour anyway; sometimes I’d rather get just a taste of something than not see it at all, and that’s definitely how I felt about this part of Iceland. Our morning began fairly early – but not *too* early by Iceland tour standards. We were picked up in downtown Reykjavik around 8:30 in the super jeep we’d be traveling in for the day. 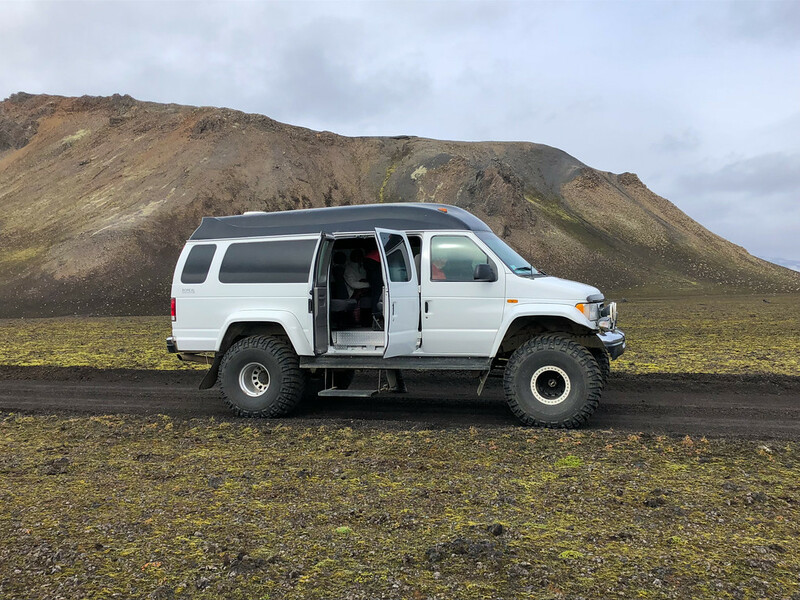 A “super jeep,” in case you’ve never seen one before, is essentially a large vehicle that looks like it’s been on the Bear Grylls version of “Pimp My Ride.” Super jeeps are HUGE in every sense of the word, and have massive tires equipped to tackle Iceland’s most gnarly roads. “Why would anyone possibly need tires that big?” my dad asked as we climbed multiple steps up into the vehicle. I kept my mouth shut, having a pretty good idea what we’d need tires that big for. It was raining lightly when we left Reykjavik, but began clearing as we drove east. Our driver, Martin, decided we’d head for the volcanos first since the clouds were lifting and you could see them on the horizon. Even though our eventual destination was Landmannalaugar, we were scheduled to make some other stops along the way, too. We made for Hekla, a 4900-foot stratovolcano that is one of the most active in Iceland. It was apparent soon enough what our super jeep was for: the miles of F roads we’d need to drive on through the volcanic desert and up into the Highlands. F roads are unpaved, uneven Highland roads that are sometimes peppered with sharp lava rock. Martin got out once or twice to let air out of the tires to make our ride a bit smoother. 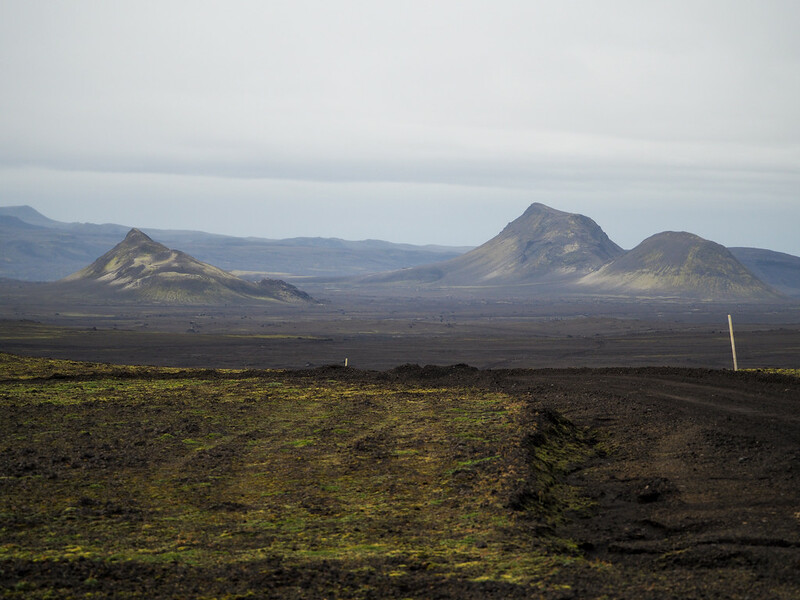 Driving around Hekla is like driving on another planet; the whole landscape is black ash and rock, sometimes dusted over with neon green moss, or the odd bit of snow. We bumped over the “road” and made a couple of photo stops before Martin really showed us what the super jeep could do by taking us off-road up into the lava rock-strewn landscape. To give you an idea of how bumpy that ride was, my Fitbit was counting steps as I was securely fastened into my seat. This part of the ride was equal parts exhilarating and terrifying; my dad shot me bewildered looks a couple of times, whispering “This guy is nuts” under his breath. I knew we were (probably) perfectly safe, but after a rather harrowing experience in a 4×4 on a previous trip to Iceland, I was gripping my seat with white knuckles the entire time. We eventually made it back to another F road, which we followed up and down some ash-covered hills and through a couple rivers. 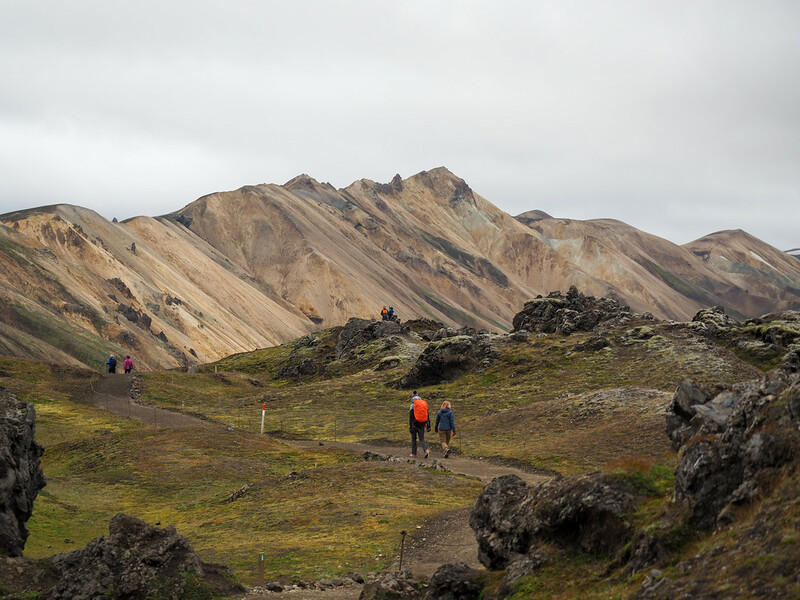 Eventually, we’d follow it all the way to Landmannalaugar. 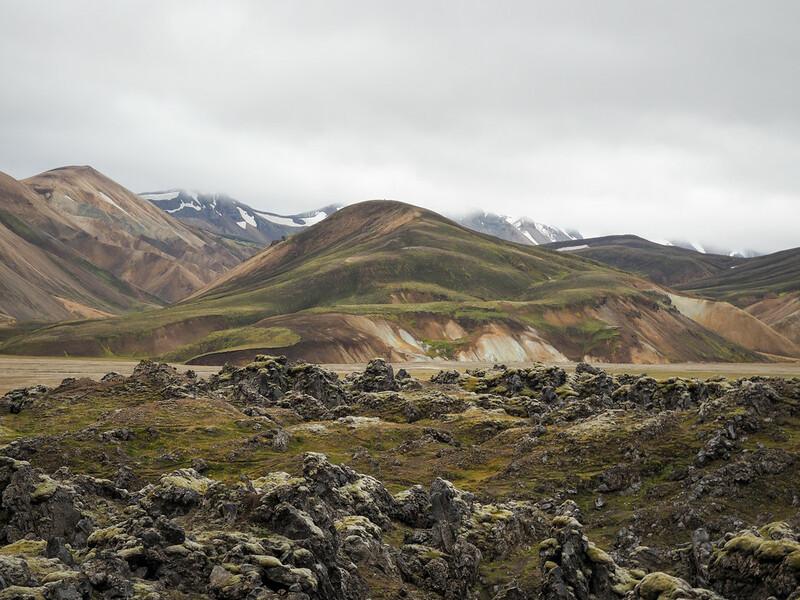 When compared to the desert we’d just come from, Landmannalaugar was practically a tourist hotspot. There’s a campsite, a few small buildings, some converted buses selling coffee and snacks, and some natural hot pools; our small group was one of many in the valley that day. We were given some free time to eat our packed lunches and either go for a walk or a swim. I decided to head up into the colorful hills for as long as the incoming rain would hold off, while my dad made for an easier trail alongside a river. I can understand now why this area is so famous: it’s incredible! Even under cloudy skies, the mountains popped with shades of browns, oranges, and greens. I spent about an hour walking on a well-developed trail, snapping photos in all directions. I was itching to go further up into the mountains, but there just wasn’t time. Next trip for sure. Pretty sure I’ll be back! After our afternoon stop at Landmannalaugar, it was time to start making our way back to Reykjavik. The weather had taken a turn towards the foggy and rainy as we left the colorful valley, so we couldn’t do as much off-roading as Martin wanted to. But he still made sure we saw more of Iceland’s incredible natural wonders on the drive back. Our first stop was at Ljótipollur, a lake surrounded by a colorful volcanic landscape. Its name translates to “Ugly Puddle,” but I couldn’t find anything ugly about it! 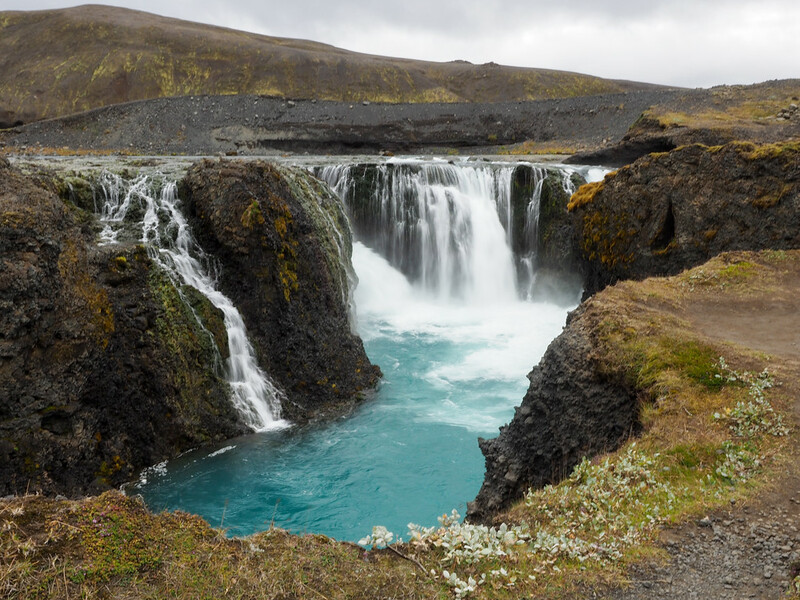 We also hit up some waterfalls on the way back, including the super-blue Sigoldufoss, and a double waterfall called Hjálparfoss. All in all, I thought this tour packed in a LOT of good stuff, and both my dad and I agreed that it had been a good use of a day. 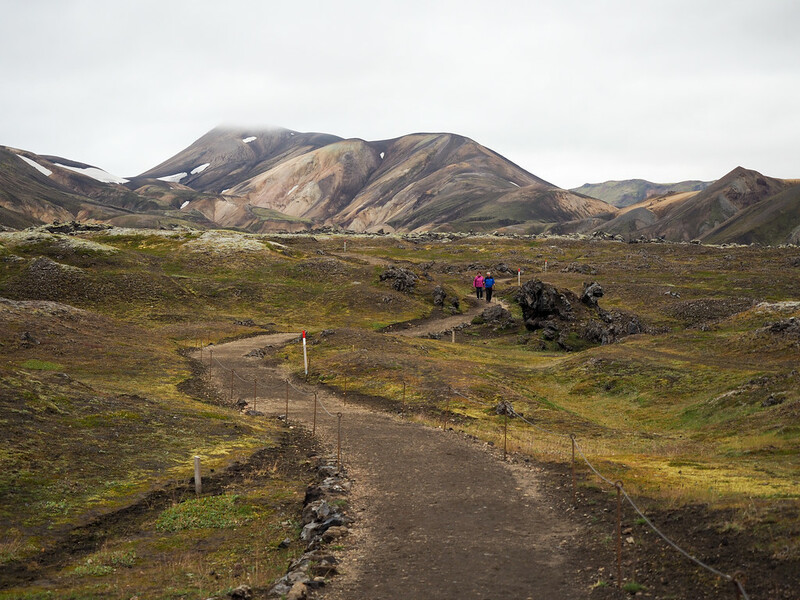 We went on a super jeep tour to Landmannalaugar and Hekla, which included quite a few stops along the way. Length: At least 9 hours, but could be a bit longer. Price: These tours range anywhere from $275-$400 per person, depending on the exact tour and time of year. 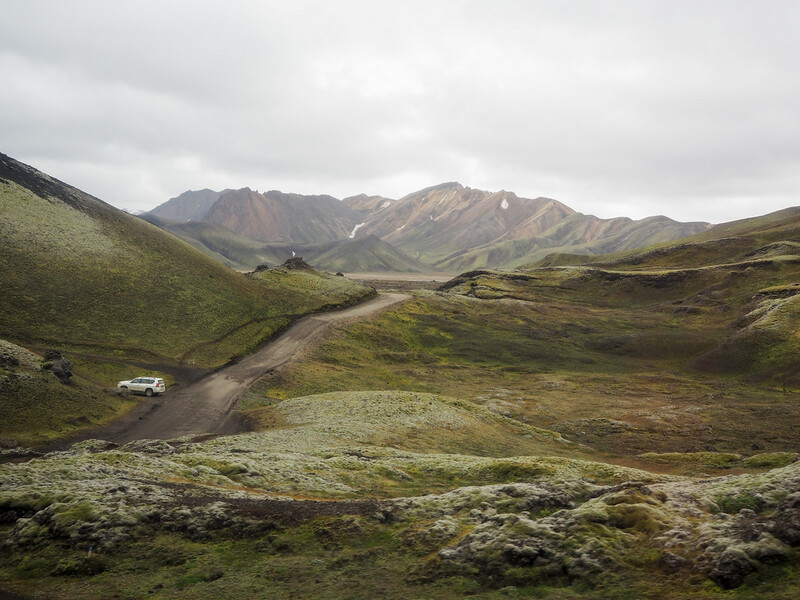 This sounds like a lot (and it is), but Iceland is expensive and you really do get more bang for your buck with a super jeep tour. Other options: If you’re looking for a more affordable tour, you can check out this bus tour, or this hiking day tour. Bring a lunch – If you’re going on a tour, I definitely recommend bringing lunch and snacks with you. You’ll probably stop at a gas station at least once if you need to pick something up, but there’s no dedicated lunch stop out in the Highlands. 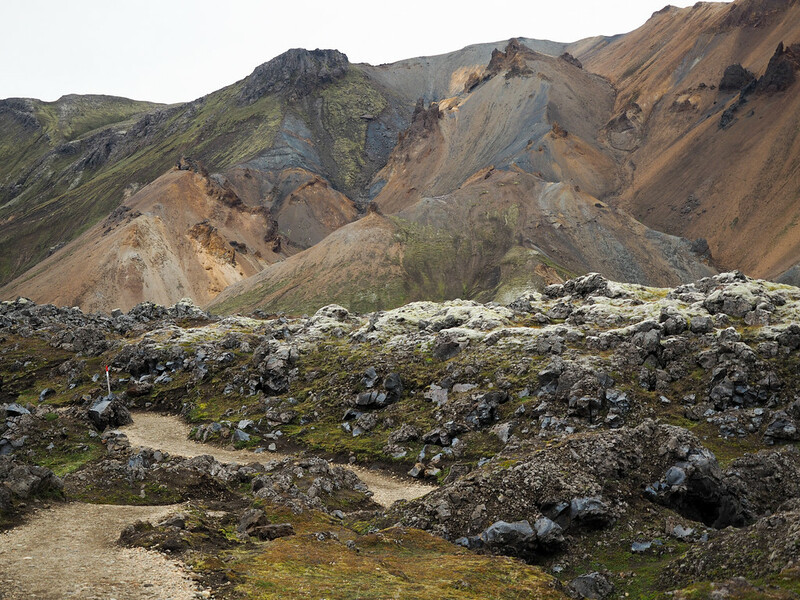 Only drive a 4×4 – If you’re making the trip to Landmannalaugar on your own, please ONLY drive the F roads in the Highlands if you’ve rented a 4×4 vehicle that can handle them. It’s actually against rental car contracts in Iceland to take a non-4×4 vehicles on F roads, but people ignore this all the time. We saw 3 vehicles with flat tires (the lava rock in the F roads will absolutely destroy normal tires), and one car abandoned in a river (normal cars can’t handle these river crossings, guys!). Don’t be that stupid tourist. If you can’t rent a 4×4, then take a tour to the Highlands instead. 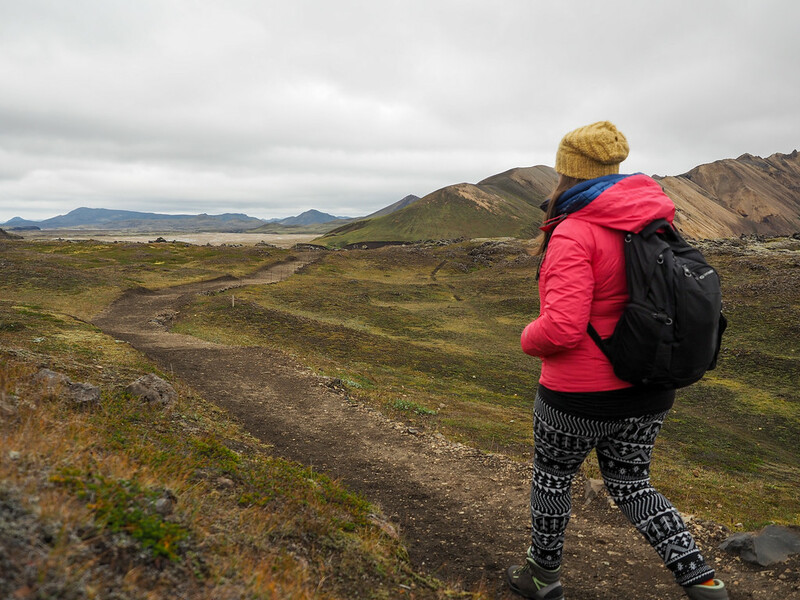 Dress in layers – It will be colder in the Highlands than in other parts of Iceland, so take this into account when packing. It will also likely be windy, and possibly wet – so waterproofs are also must-haves! Items I took with me on this trip included a thermal turtleneck, down vest, down jacket, waterproof rain jacket, thermal leggings, rain pants, good hiking boots, warm socks, and a good hat and scarf. 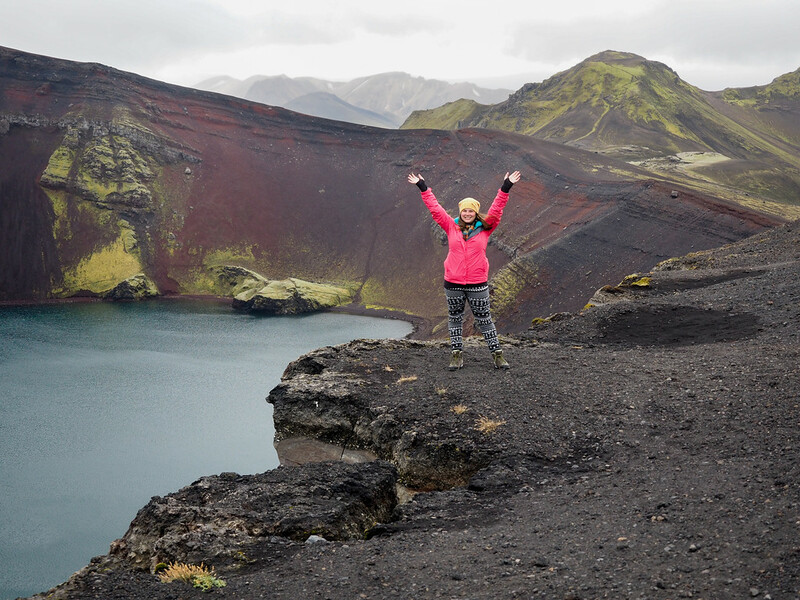 Check out my Iceland packing list to see more things I recommend taking. Go in the summer – While tours do go to the Highlands in the winter months, most of the roads close and/or are covered in snow after early October. 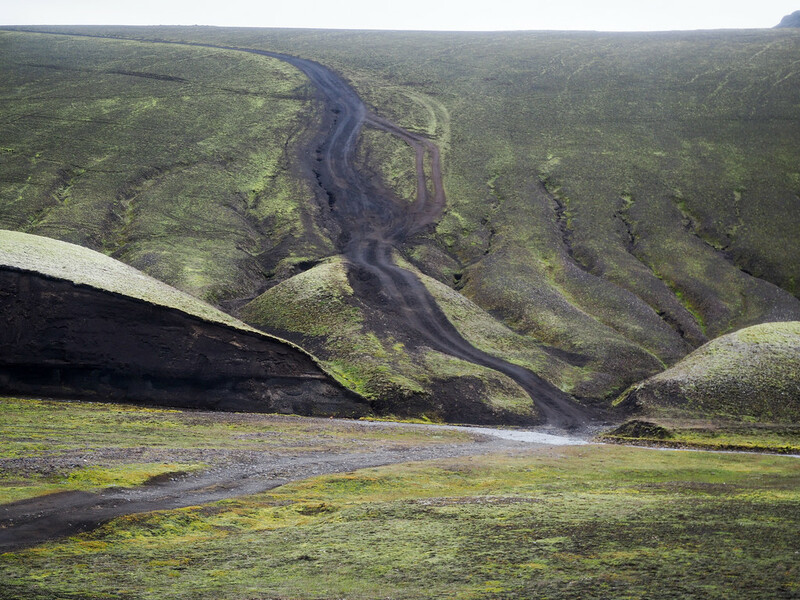 So after summer ends, you can pretty much ONLY access this part of Iceland in a 4×4 or super jeep. I recommend going in the summer, since that’s when you can see all these beautiful contrasts and colors! So what do you think? 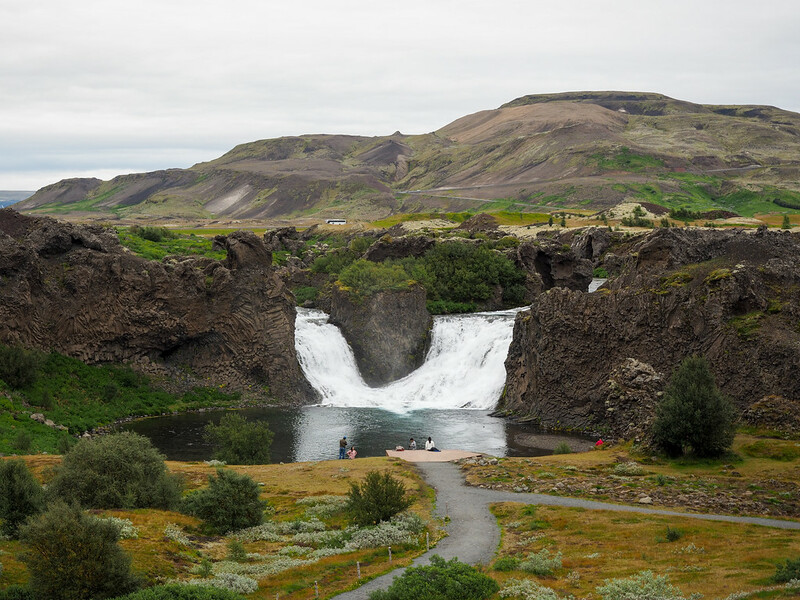 Is this a day trip you’d like to take in Iceland?